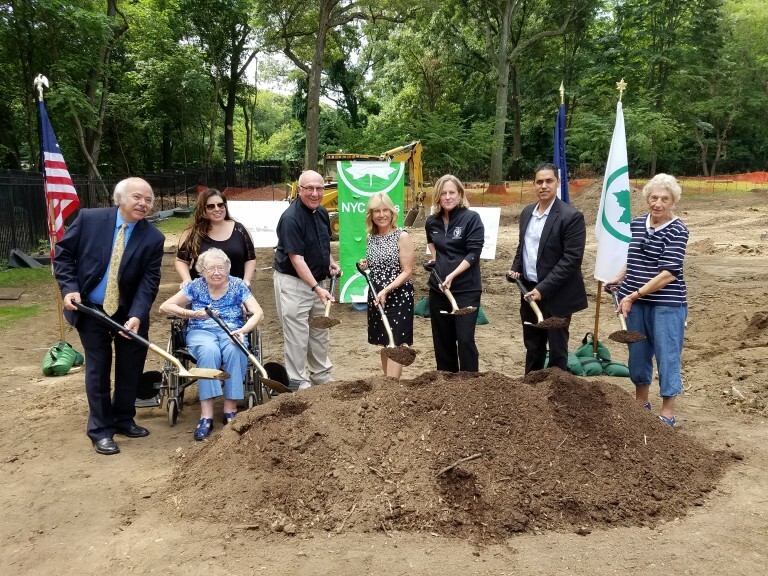 Queens Borough President Melinda Katz (third from r.), City Parks Queens Borough Commissioner Dorothy Lewandowski (fourth from r.) civic leaders and other guests helped break ground last week on $1.45 million in upgrades to the Joseph DeVoy Playground in Forest Park. The upgrades are being fully funded by the Borough President’s Office and feature the addition of dynamic playground equipment, including steel drums, accessible swings and a new tire swing. The playground’s main entrance will also be regraded and the entrance gate will be replaced with one that allows for better access to the site. The upgrades are scheduled to be completed by next summer, Katz said. Joining Katz and Lewandowski at the groundbreaking were (l. to r.) Michael Palermo, president of the Forest Park Trust; Doris DeVoy (widow of Joseph DeVoy, for whom the playground is named); Heather DeVoy (granddaughter of Joseph and Doris DeVoy); Bishop David Benke of St. Peter’s Lutheran Church; Community Board 9 Chairman Raj Rampershad; and Barbara Stuchinski, chair of the Parks Committee of Community Board 6 and co-president of the Forest Hills Community and Civic Association.